This screenplay is not a docudrama. The story is set in the U.S. It turns on the fact that the central character is a product of the cultural majority. In the U.S. that makes Jody Thomas a White man. The ethnicity of the other characters is irrelevant. Which means the same principle applies if the story is set in other countries. There is also no provision, by design, for ethnic references or issues. everything that dies is deprived of meaning. that life has a meaning... . It looks like a deep-sea tank with circular ribs, large bolts on the outside and a series of waist-high windows. Inside are two square-backed chairs with straps on the arms and legs. The base of each chair is fitted with a round container with holes and a connecting pipe. Everything is painted a light, passionless, mint green. The chamber looks almost two-dimensional as if it were lifted out of an illustration or off the cover of a 19th-century magazine. Two OFFICERS are at the chamber. They are methodically performing a dry run of the system. The sound of their voices and movements is soft, intimate. There is a harsh, clanging sound as the SECOND OFFICER yanks the lever on his last command. A police car with flashing lights makes its way through a loud melee of people, signs and bright tv lights. This is the first execution in the state since the death penalty was reinstated. With the uproar over lethal injection, the state was left with only two options. And in a bizarre twist last week, the state supreme court banned one them, death by hanging, as cruel and unusual punishment. That left the gas chamber and it will be used tonight. I don't know. I don't know. He's a (bleep) cop-killer and he's gotta pay for that. But I don't know why they couldn't wait to do it right. I don't know. I don't know. They shoulda hung him, break up his (bleep) neck. Nothing cruel about that. The PROTESTER yanks the OTHER away from the camera. And so the vigil continues. Even as the wind comes off the bay and brings a cold, wet fog with it, this huge crowd waits, bathed in candlelight, faces turned toward the North wing of the prison where Jody Thomas waits, and watches as the clock counts down the 30, now 29 minutes remaining before that midnight hour when this state will hold its first execution in 20 years. PULL BACK TO the face of the REPORTER on a tv SCREEN. In one of two holding cells, next to the infamous chamber, JODY THOMAS, 31 years old, thin and muscular, is seated on a bench along with the CHAPLAIN, a Catholic priest in his 60’s. Next to them is a tray with drinks, candy bars and an open pizza box. The cover of the box reads: “On Time, Every Time!” A GUARD stands nearby. Hey, could you turn that up. Father, how about it! He turns up the sound. ...a day full of last minute legal maneuvering, rancorous press conferences, and clashes between pro and con groups. Here was the scene a few hours ago. TV screen shows pictures from earlier in the day. Man, they're excited. I mean, I can't believe there's all those people out there. You afraid to die, Father? I... sure, we all are. That's why it's important to make our peace with God. Can you do that for me, Father? 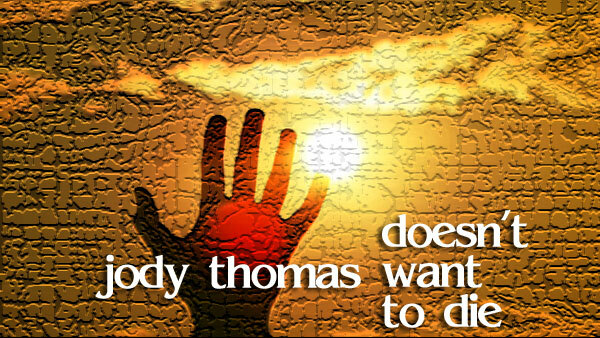 I can help you do that, Thomas. I can help you prepare for your salvation. Nah... he's mad at me. I'll catch him later if I see him. Why don't you finish-up there, Jody. Don't think so. Haven't really got a good reason to eat. You want some, you want a slice? It's real good, just the way I like it. I think we should get ready, Thomas. Ready? Oh yeah I'm ready. You could prepare your mind, your spirit. We can pray together. Nah, I'm ready. Pray? I never learned how. I said I won't be any trouble. I said I'm ready. We know you are, Jody, we know you are. A SECOND GUARD steps through the outside door in the cellblock. Stops, turns back, talks to someone outside. You have a stay, Thomas, a stay! The Appellate Court gave you a stay! JODY turns away, presses his face into the wall. The FIRST OFFICER stands outside the door juggling two hot cups of coffee. He finally manages to open the door and enters. Inside, the WARDEN, a tall man in his early 50’s. Here’s your coffee, sir. You want black or white? Take the black, it’s sweeter. WARDEN takes a cup, moves to the window, looks at the vigil outside the gate. Drag it out, screw it around. The lawyers play their games and every one goes crazy. Ain’t right to keep stalling like this. Don’t make no sense. Makes sense to me. Nobody wants to pull the switch. God I wish they’d get this over with. Phone rings. The WARDEN listens for a moment, nods, puts it down. His face tightens. I wish I had some chili powder. I like it hot, you know what I mean? It must be pretty cold by now. No, I mean the taste. I like it spicy. I'm not really a pizza eater, myself. No? Ahh, that's too bad. Nothing like a slice of pizza and a cold beer. The outside door opens. MICHELLE steps in, late 20’s, casually dressed. Hey, it's my lady... my lady-lawyer. Got to go back to court, huh? No. They vacated the stay, overturned it. The outside door opens. The WARDEN steps through followed by two guards. He stops at the cell. Armed guards hurry down the stairs, followed by civilians being escorted in single file.